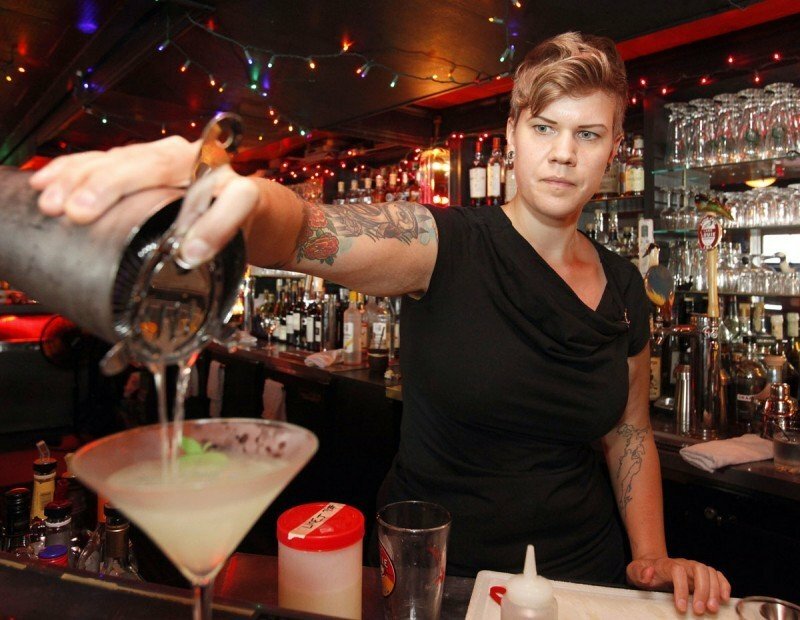 Heather Buechler, a bartender at the Greenbush Bar, pours a Last Word into a martini glass. The cocktail has a pale green color because of the green Chartreuse, and also includes maraschino liqueur and fresh lime juice. 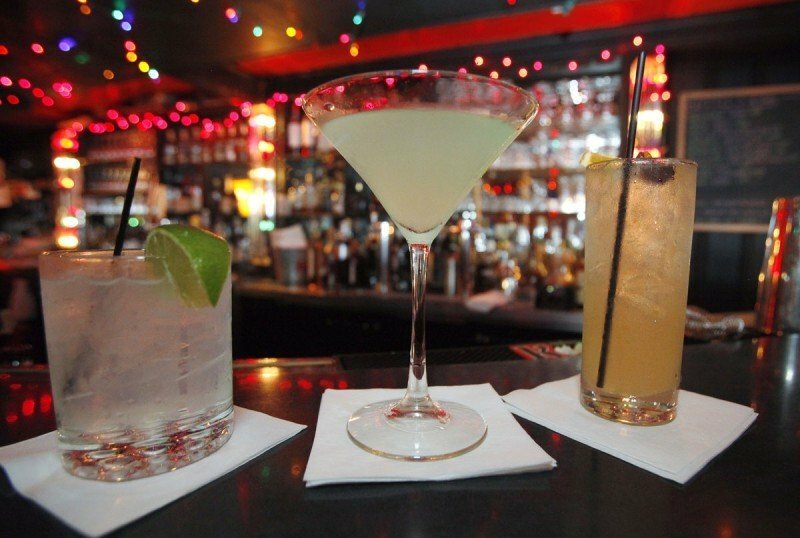 From left, a World’s Best Gin and Tonic, Last Word and a Tom Collins at Greenbush Bar on Regent Street. Every summer, Greenbush bartender Heather Buechler — a self-described "brown liquor kind of lady" — changes her cocktail order from whiskey to gin. "It's always been my summer mixer," Buechler said. "I really really love gin." So it's no surprise that on her current bar menu, six out of nine cocktails are made with the spirit. Greenbush, located in the basement of the Italian Workmen's Club on Regent Street, may be better known for its pizza and extensive selection of bourbon. But for summer sipping, the bar also stocks plenty of gin, including Tanqueray, Sapphire, Boodles, Small's and Hendrick's, a cucumber botanical gin. Gin was born in Holland as genever, made from rye and barley and flavored with juniper. British soldiers got a taste of it in the early 1600s and attempted to recreate it in London. They had little success until 1827, when Robert Stein invented the continuous still and made gin — first the sweetened Old Tom style, and later the London dry style with the Beefeater on the label — safe to drink. Gin has been described, often accurately, as tasting like a pine tree smells. But many gins on the market now (including a fair number of American brands) also have flavors of fennel, coriander, citrus and herbs. The only cocktail on the Greenbush blackboard is its "world's best" gin and tonic ($7), for which Buechler uses Uncle Val's, a botanical gin made in Oregon. Buechler said it "tastes like lavender and cucumber and sage." "That's why it's so good just in a gin and tonic, where it can kind of be by itself," she said. "It's a smoother, sweeter gin." For herself, Buechler uses gin to make a "ginjito" with lime and mint, or a classic Aviation ($8), a slightly sweet cocktail made with a maraschino cherry liqueur called Luxardo, fresh lemon juice and a splash of Crème de Violette. For a Last Word ($8), another classic, Buechler uses Death's Door gin, which is made in Middleton. She considers Death's Door "a great utility gin," made in a dry style with lots of juniper flavor. Served up, the Last Word combines green Chartreuse with Luxardo and fresh lime juice. Ransom Spirits' Old Tom gin is a traditional style made from malted barley and corn, with a slight brown tint that comes from three to six months aging in wine barrels. "If you drink bourbon, you'll definitely notice (the oak), especially if you're used to neutral gins," Buechler said. "It's not what you think of when you think of gin." Buechler said the Old Tom has flavors of coriander and lemon, so she pairs it with fresh lemon juice and simple syrup in a tall, icy Tom Collins, garnished with a brandied cherry. It's straightforward, refreshing and perfectly summery. "Gin has definitely experienced a comeback," Buechler said. "There's a lot more gins out there now, and there's a lot more people trying new gins. "Just working here over the past few years, the amount of people I get looking for gin cocktails has increased … and when I go out, there's a lot more gin cocktails to try." Lindsay Christians occasionally pours tastings at Barriques. From Heather Buechler at the Greenbush Bar. Makes 1. Shake over ice and serve up in a martini glass. Combine first three ingredients in a large glass of ice and stir. Garnish with an orange slice and a brandied cherry.